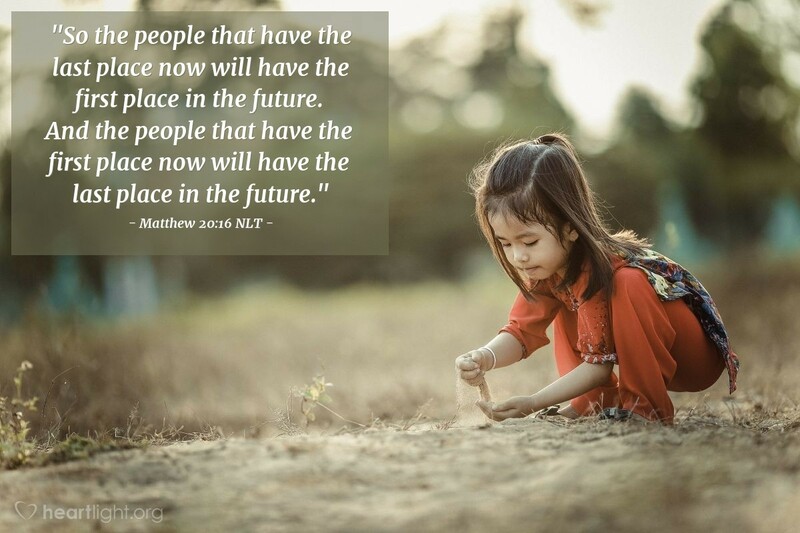 "So the people that have the last place now will have the first place in the future. And the people that have the first place now will have the last place in the future." Reversal! When God settles all the accounts, then things are going to be valued by his standards and not the world's standards. The people whose hearts are yielded to him will be recognized as his children no matter their lack of rank or riches in worldly society. Those who recognize their grace at being included in God's Kingdom will be given places of honor. So our goal as disciples is to value things now as God will later. Our job as disciples is to keep searching and including the lost, the last, and the least in the Kingdom and not just those who can bring us some outward benefit. Remember, God doesn't look at us the way people do. People look at the outward appearance, but God knows our hearts. O Lord God, your grace to me is marvelous. Your promises are thrilling. I can't wait until you send Jesus with power and show things as they should be and reward people based on their character, their hearts, and their gratitude for your grace. To you be all praise and honor and power and glory belong, both now and forever. In Jesus' name. Amen.